As a young boy growing up in Swansea, South Wales, Michael always maintained a deep and abiding passion for the natural world. Losing himself in books on nature, gardening and wildlife, he would spend most of his time exploring the magnificent rural countryside around the Gower coast and peninsula. His present focus today in his drawings and paintings is partly derived from those formative years spent reveling in the magnificence of plants and flowers. Michael likes to paint large floral works, still life vignettes and various other subjects in oil. Following in the footsteps of the early Victorian plant collectors, he also likes to use watercolours and various drawing mediums to capture detailed botanical works on a smaller scale. As well as botanical and still life subjects, Michael's work also includes figurative drawings, landscapes and abstract paintings. 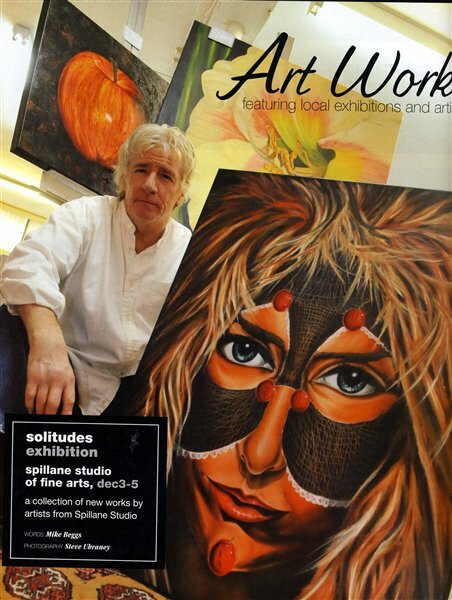 Although mostly self taught in the classical drawing and painting traditions, Michael has studied commercial art with a diploma in illustration and design to his credit. He was art director for both Plant & Garden magazine and Building Management & Design magazine, designer for Pegasus Publishing (Ottawa) and graphic designer and layout artist for CAA Central Ontario. His illustrations have appeared in many publications including Ottawa Magazine, Log Homes Illustrated, The Growing EDGE magazine, Long Term Care magazine and British Heritage magazine. Michael also implemented art therapy programs in Toronto and produced commissioned paintings and logo design for Chateau Laurier in Ottawa. Michael now works as a full time artist and teacher, offering courses and workshops in drawing techniques, botanical drawing and painting, watercolour and oil painting. He has taught at Visual Arts Mississauga (VAM), Burlington Art Centre, Toronto Botanical Gardens, Guelph School of Art, Southampton Art School, Hardy's Hobbies & Crafts (Madoc, ON), London Brush and Palette Club (London, ON), Elora Centre for the Arts and, in 2005, opened his own teaching facility in Mississauga: Spillane Studio of Fine Arts. Michael is a creative and passionate individual and enjoys sharing his experience with others and passing on those special little techniques that help to create a great work of art. With his early years spent working and studying at Swansea's botanical gardens and at Cannington College of Horticulture in England, Michael developed a strong interest in plant science, landscape design and conservation. This early training allowed him to pursue many opportunities in the horticultural industry and he has managed landscaping projects in different parts of the world. He has also been involved in scientific research and has produced feature articles for The Growing EDGE magazine (Oregon) for over sixteen years. As part of a multimedia biology curriculum at Wheeling University in West Virginia, a series of his articles were published in cooperation with NASA. He has conducted speaking engagements, lectures and radio interviews on gardening, conservation subjects and art-related topics, and has published over 300 articles. His creative garden designs have been featured on HGTV (Backyard Pleasures), the Toronto Star, Plant & Garden magazine and the Oakville Gardens Tour. Michael has over twenty-five years freelance writing experience and has published over 300 articles worldwide. He is a former editor of Plant & Garden magazine and also Building Management & Design magazine; feature writer for The Growing EDGE magazine in Oregon; music columnist for Hamilton Magazine and writer/editor for CAA Central Ontario. Michael's articles have appeared in: Plant & Garden magazine, Montreal Gazette, Ottawa Magazine, Ottawa Living Magazine, Log Homes Illustrated, Hamilton Business Magazine, CAA Today, Chatelaine magazine, Building Management & Design magazine, Yoga & Life magazine, The Growing EDGE magazine, Ottawa Citizen, Ottawa Business Magazine, Harrowsmith Country Life, Hamilton Magazine, Leisureways travel magazine, British Heritage magazine, Long Term Care magazine, Classical Guitar Magazine and Oakville Today. A true renaissance person, Michael has also been involved with music for most of his life. As a teenager he started out playing drums in a local rock/pop group and then moved on to guitar and songwriting, playing folk clubs and other venues. Finger picking and ragtime guitar led Michael into studying classical guitar and music theory. 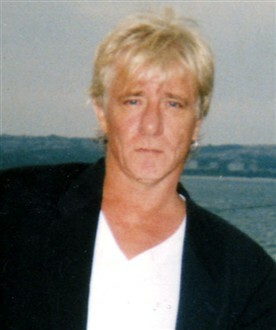 During his time in Bermuda, he was a regular performer at the Bermuda Folk Club and other places on the island, where he recorded his independent album, Sweeter than Wine. In 1998, he contributed a song for the Special Olympics CD Courage to Shine, and co-wrote a collection of songs for an album with Lisa Hartt. Since moving to Toronto, Michael has been involved with several musical projects, (recording and performing), and continued his classical guitar studies with the legendary Eli Kassner. 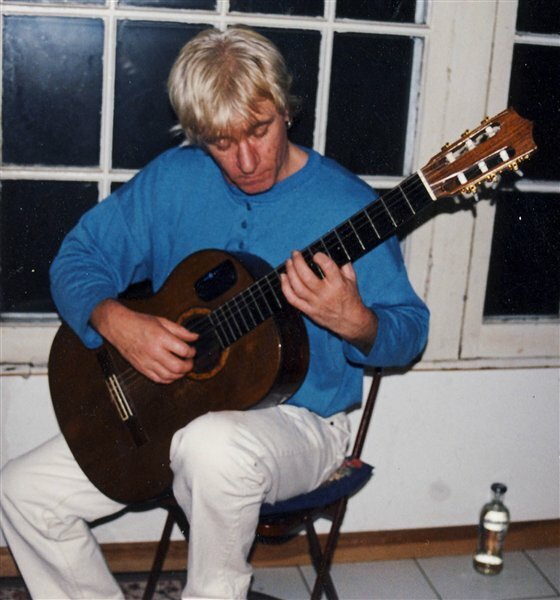 Playing my Michael Gee classical guitar in Toronto. I bought this guitar in Nottingham, England in 1981.